I’m a trail and mountain ultra runner, born and raised in Vancouver, BC. I’m very proud to be a member of the Team Salomon Canada, and a sponsored ambassador for Suunto, CLIF Bar, and Hillsound Equipment. By day, I run a video production agency and, in what little spare time I have, also produce running films and documentaries. My running story began fairly late in life; at 27 – far from a high school or collegiate running background here. This is about the age they say you achieve peak physical performance but when I turned 27, I didn’t feel like I was at the peak of much at all. As a kid, I dabbled in various team sports but I wasn’t very good so nothing really stuck. I eventually gave up organized sports altogether in favour of things like playing music, but still enjoyed hiking and camping. I later started working out at the gym, as you do in your twenties. I’d go for the occasional ‘jog’ but never more than a few miles and never with any consistency. I have always tried to eat a balanced, plant-based diet, having been a vegetarian with a sushi addiction for over a decade (aka ‘pescetarian’), and I did give up smoking at some point although I can’t remember when. When a friend mentioned training for his first marathon, it made me think maybe I could do that. So, after struggling through a half-marathon in Seattle in 2008 and my first marathon at the BMO Vancouver Marathon in 2009, I had found a new passion. I went on to finish several more marathons, including Victoria and Chicago, but being well past the honeymoon phase of my running, I found I was getting diminishing returns. I had once again fallen short of a Boston-qualifying time, had found myself fairly regularly getting overuse injuries, and started to look for a new challenge. When I found myself in Hong Kong after just having run another late-Fall marathon in Seattle, I did a quick search for races online and decided that something called the Tai Po Mountain Half-Marathon, part of The North Face® King of the Hills Mountain Marathon Series, sounded like a good chance to test my fitness on some hills. I had always loved the outdoors, having done lots of hiking and trekking locally and (more recently) internationally, and would occasionally take my training runs to the trails, especially in the off season when pace was less of a concern. But I had never done an actual trail race. It turns out that Hong Kong has some beautiful trails and a vibrant running community. I also realized that 1250 meters cumulative elevation gain and equal loss over 14.75k is no joke. I had some difficulty walking around the city the next couple of days but I was definitely hooked and began my journey from road to trail running. My first full season on the trails in 2013 included several 50k’s, my first 50 mile and 100k races. I learned that, while I may not have the natural talent and athleticism for the technical descents, I was pretty good at and enjoyed the climbing. Running has now become about much more than racing. 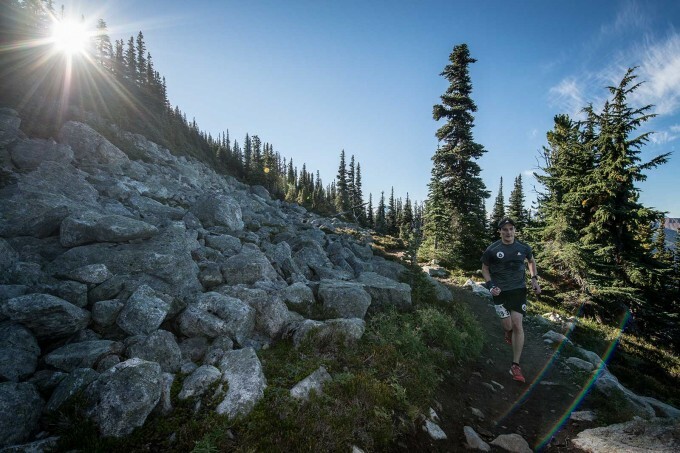 Trail and ultra distance running has allowed me to run in some incredible destinations, like the Grand Canyon and Mount Rainier, with places like the Howe Sound Crest Trail, Garibaldi Park, and Hanes Valley becoming my regular stomping grounds. I’ve met a ton of great people who I can look forward to going on amazing adventures with every weekend. In 2014 I ran my first 100 miler, and stepped it up again in 2015 with the Fat Dog 120 miler which is my longest run yet, and the Grand to Grand Ultra, my first staged race. I’ve got many more races to come, along with some great destination runs and adventures. So follow along as I continue my journey. I’m still no expert but I’m learning a lot along the way.